Cannabinoid receptors and their endogenous ligands are located throughout the limbic, or “emotional,” brain, where they modulate synaptic neurotransmission. 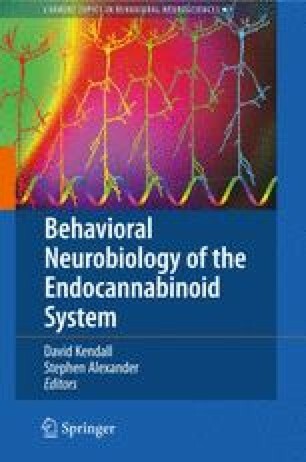 Converging preclinical and clinical data suggest a role for endogenous cannabinoid signaling in the modulation of anxiety and depression. Augmentation of endocannabinoid signaling (ECS) has anxiolytic effects, whereas blockade or genetic deletion of CB1 receptors has anxiogenic properties. Augmentation of ECS also appears to have anti-depressant actions, and in some assays blockade and genetic deletion of CB1 receptors produces depressive phenotypes. These data provide evidence that ECS serves in an anxiolytic, and possibly anti-depressant, role. These data suggest novel approaches to treatment of affective disorders which could include enhancement of endogenous cannabinoid signaling, and warrant cautious use of CB1 receptor antagonists in patients with pre-existing affective disorders. CJH was supported during the writing of this review by Research for a Healthier Tomorrow, a component of the Advancing a Healthier Wisconsin endowment at the Medical College of Wisconsin and NIH grant R21 DA022439.